One of my favorite activities outside of playing video games with friends is cooking meals with my wife. Our kitchen isn't big so there's a little bit of a hectic dance as we move around each other for counter space, but it's always fun. 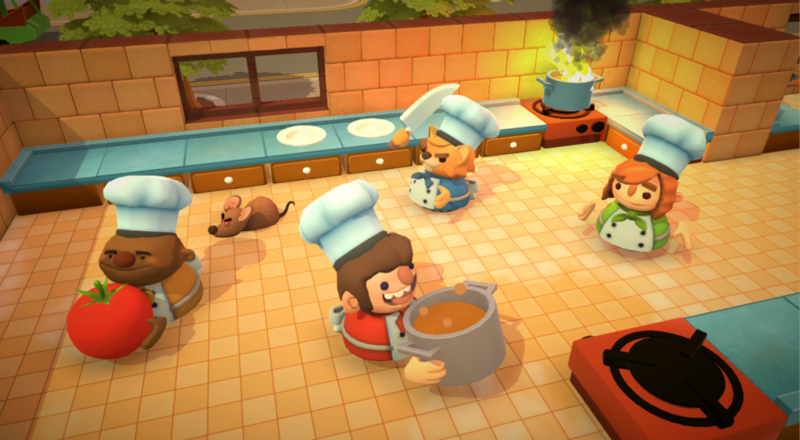 Apparently, the two-man development team over at Ghost Town Games also enjoy cooking cooperatively as their first title, Overcooked, is just that. Inspired by experiences in real-life restaurant kitchens, Overcooked places players in the non-slip shoes of chefs that are tasked with serving up meals as quickly as they can to their hungry patrons. Of course, it's not as simple as grabbing ingredients and tossing them into a pot or skillet. You'll need to chop up the veggies, cook them, serve them up, and do the dishes. In other words, everyone has a job to do. Cooperation is key and it is one of the main design elements the developers had in mind when they set about making the game. Overcooked will be released later this spring on the PlayStation 4 and Xbox One, and is currently seeking release on Steam via Greenlight; so if you're interested in playing this game on the PC, head on over to the page and give it a thumb's up. Page created in 0.6541 seconds.